Bismarck, N.D. — The American Society of Civil Engineers’ (ASCE) North Dakota Section released the inaugural Report Card for North Dakota’s Infrastructure, giving eight categories of infrastructure an overall grade of a “C.” According to the report, this means the state’s infrastructure systems are in mediocre condition and require attention. The report includes an evaluation of the following eight categories: bridges (D+), dams (D), drinking water (C), energy (C+), levees (C+), roads (B-), transit (C-) and wastewater (C-). The Report Card assigned roads the highest grade with a “B-.” Sixty-seven percent of urban roads and 77 percent of county and township roads are in very good condition, and the percentage of congested roadways in the state remains at less than 5 percent, significantly below the national average. However, there is still work to be done, particularly in addressing roadside safety, alternative funding sources, and the allocation of resources in populated and high growth areas. North Dakota’s freight network, including its roadways and bridges, moves high volumes of agricultural and energy products and needs a system in good working condition to do so. The lowest grade is dams with a “D.” Forty-nine of North Dakota’s dams are high-hazard potential. Of the state’s high-hazard potential dams, 73 percent have a condition assessment rating and 50 percent of these are deficient and do not meet accepted safety standards. Although state dam conditions are of concern, dams are regularly inspected and most high-hazard potential dams have emergency action plans. Bridges in North Dakota received a “D+,” also one of the lowest grades in the Report Card. Roads and bridges are intertwined infrastructure systems, and this grade discrepancy between the two categories demonstrates the investment gap between the two. Currently, there is a $400 million backlog of necessary bridge projects, while roads may face a $2.5 billion shortfall in funding if North Dakota does not identify an increased sustainable funding source. This is also evident in the fact that 14 percent of the state’s bridges are structurally deficient compared to the national average of 8.9 percent. Over $1 billion has been spent, from all funding sources, on flood related projects along the Red River alone since 1997. In addition to an assessment of the state’s infrastructure systems, the Report Card also offers three overarching recommendations to improve the state’s infrastructure and the overall grade. The first is to implement sustainable funding sources. North Dakota currently has one of the lowest gas taxes in the Midwest and hasn’t been raised since 2005. Another source of sustainable funding would be to tap into the North Dakota Legacy Fund, which can be used to provide low interest loans for infrastructure improvements. The second solution is to encourage and fund innovative design solutions and technology to keep the state competitive nationally and globally. Finally, the Report Card suggests working with infrastructure owners to develop asset management plans. It is important for infrastructure owners to have enough information to properly prioritize key projects and determine where to spend limited funding. 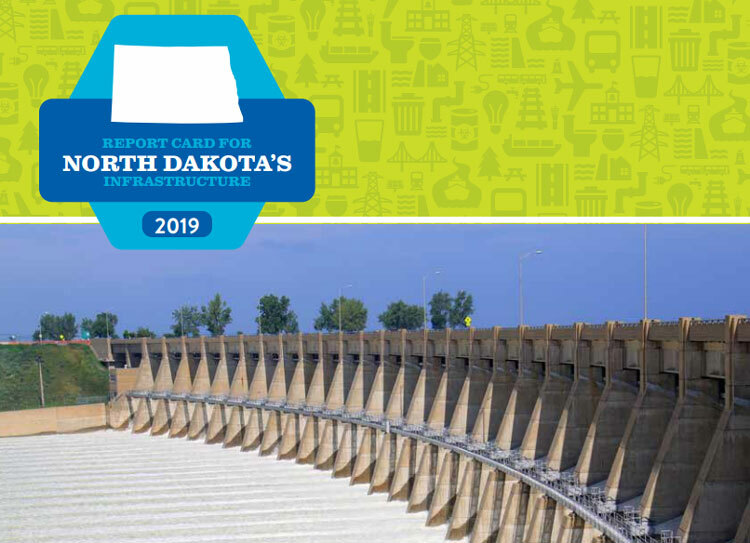 The Report Card for North Dakota’s Infrastructure was created as a public service to citizens and policymakers to inform them of the infrastructure needs in their state. Civil engineers used their expertise and school report card letter grades to condense complicated data into an easy-to-understand analysis of North Dakota’s infrastructure network. A full copy of the Report Card for North Dakota’s Infrastructure is available at https://www.infrastructurereportcard.org/state-item/north-dakota.